We've been transfixed the last twenty-four hours watching the aftermath of Hurricane Sandy; how weird it feels to be on the other side of a tropical system. Here it's strangely clear and beautiful...and a bit chilly. Yesterday, my day off, I went to early vote. I waited nearly an hour and I was so glad I grabbed a sweater before I walked out the door...unfortunately it was covered in pet hair (so I was that person in line). Further disappointment, was when I didn't realize an hour wait, standing in line would wear me out for the entire day. Sometimes, I forget it's only been a year and half since I went through radiation treatment and I try to behave like any other 30 something year old. 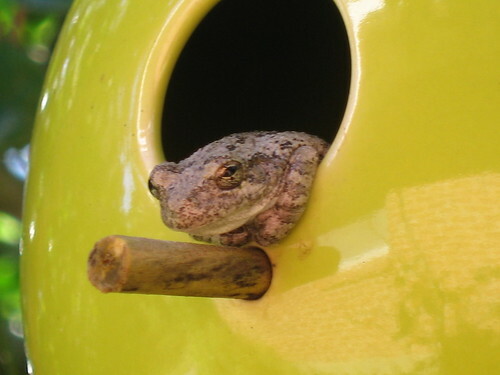 C fussed at me when I got home...why didn't I sit down, tell someone...I don't think I realized, myself, until I poured myself back in the car to go home. Back home, I had planned a lot of "to do's"...lots to make for the shop, clean the house so it looks as good as everyone else's in their blogs, fix an amazing dinner...none of this happen. 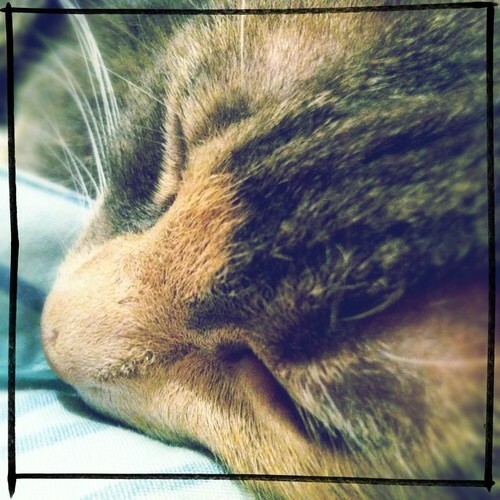 I went straight to bed with a persistent headache and snuggled under a warm couple of quilts, joined through out the day by at least two dogs and two cats who peacefully slumbered while I treated myself to a couple foreign films on Netflix and perused the Craftsy online class catalog . Sometimes I have to remind myself to step back because fortunately even though I'm healthy, I don't always have the stamina but I do have tomorrow. If you've been waiting for an opportunity from Spoonflower to snag some great fabric at a fantastic price, the wait is over! 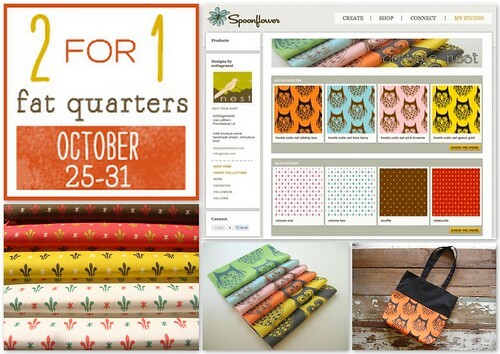 Now thru October 31st, all fat quarters are 2 for 1. Please take this opportunity to check out two of my newest collections: Hootie Cutie, a fun, whimsical owl print in 6 colorways and Julia's Kitchen, a lovely fleur de lis print paying homage to the great chef Julia Child in 5 colorways. review all my Wordless Wednesday pics here. 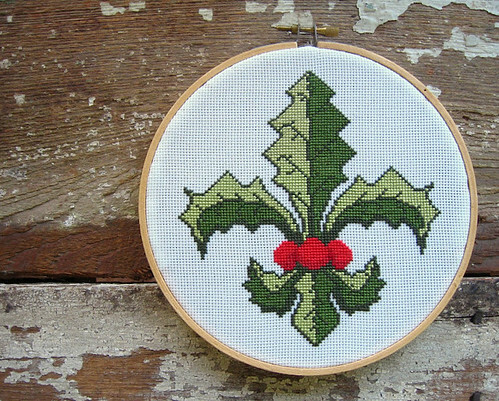 Happy Holidays Fleur de Lis Holly Cross Stitch Kits Are Here! They're here! I've assembled just a few kits of my new holiday pattern, so please do not wait to order as I doubt I will have time this season to assemble more. 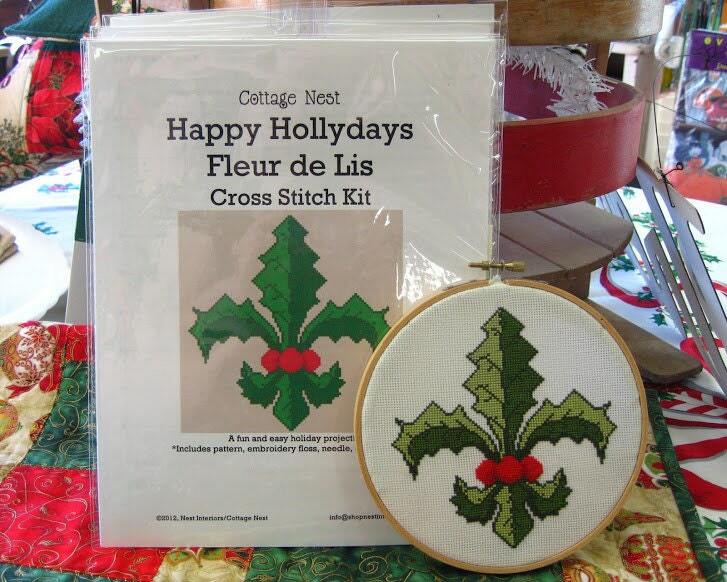 Each kit includes the pattern in color with symbols, all embroidery floss needed, aida cloth, and a needle. I have even included some basic cross stitch instructions if you would like to give this to someone with little or no embroidery experience. The only items you will need additionally are a hoop and scissors. The pattern alone will remain available from Etsy and instant download from Meylah and Craftsy through the holiday season. 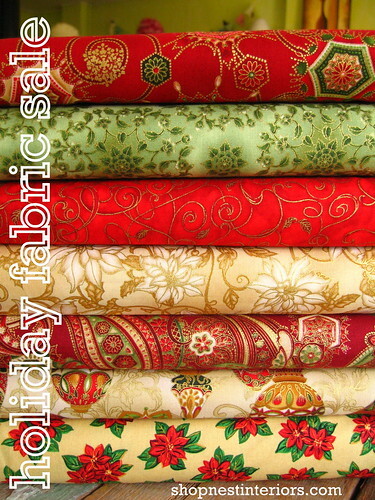 Here's a new feature...Friday Featured Fabric! I love vintage fabric and I'm also so excited to have expanded my business to carry new yardage, that I want to take nearly each Friday to showcase some unique pieces I am offering. Today I want to highlight these sweet little pre-cut charm packs I'm putting together with vintage scraps. This set is the first of a few in the works and its bright and colorful in red, yellow and blue. My favorite is the pretty calico rose print; however, the Raggedy Ann and Andy print is probably the most unique and most rare. To coordinate, I chose a vintage gingham and a little bit newer blue polka dot. 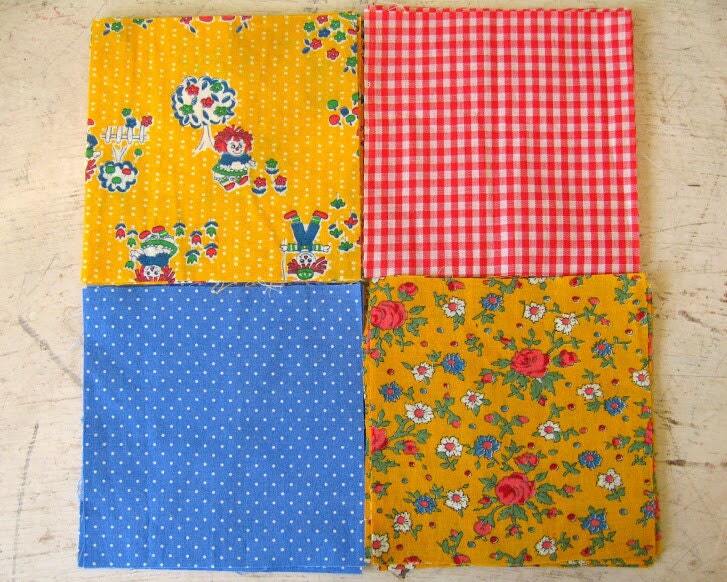 Each set has 25 pre-cut squares measuring 5" x 5". I only had enough to cut for two packs (one left! ), so if you would be interested in one or both, please visit my Etsy shop. Is there an intervention for embroidery/crochet people?! I think I need to be first in line! I was just checking in on Ravelry the other day and happened on this adorable pattern for an owl tote bag. Of course, with the shop getting busier by the day and all of the other items I'm making for the shop I totally don't have time to make this...um yeah, I bought it. 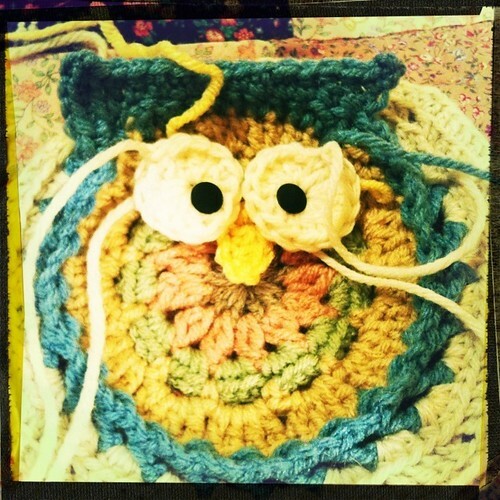 And I just couldn't wait to start...so here's one owl nearly done! 7 more to go...unless something else distracts me. All joking aside...this is an excellent pattern (take it from someone that writes them) - well described step by step with lots of pictures. Get your here or here. We've ended up with quite a healthy crop of Pecans this season despite Hurricane Issac, so I'm always looking for ways to incorporate them into my recipes. Also, down South, it's Persimmon season...a weird fruit similar in shape to a tomato but very sweet when ripe. They really aren't commercially available because as they ripen the fruit is so tender it tends to break and ooze pulp; you really have to have your own tree or know someone with a tree (and most people are quite accommodating as the fruit spoils so quickly). I usually try to freeze a good bit and I always use this recipe I adapted from an old 1982 Southern Living Annual Recipe Cookbook. 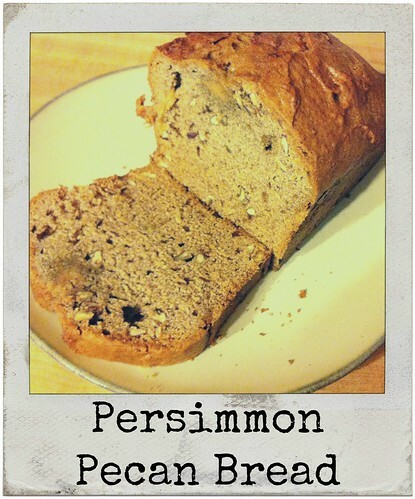 It's delicious and one of those rare recipes for Persimmons that I find people who love or hate the fruit, love this bread equally! cream butter, gradually adding sugar - beat well. Add your eggs one at a time, beating well after each addition. In a separate bowl combine the pulp and soda and let it sit and dissolve. Blend in the rest of the ingredients with the butter and sugar mixture; stir well. Add pecans and pulp mixture and beat well. Pour into a greased 9x5x3 inch loaf pan. Bake at 350 degrees for 1 hour and 20 minutes. Cool for 10 minutes. I know I've disappeared for a while now but it's with good reason, I promise! 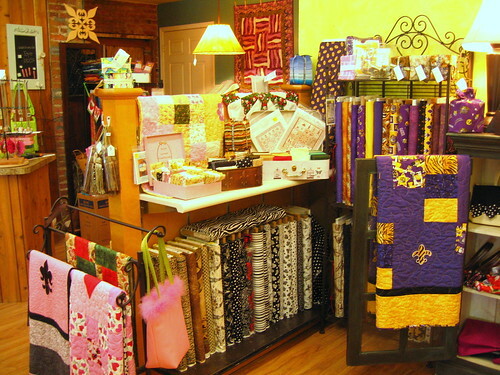 We've expanded our shop to now include fabric and notions by partnering with our local quilt shop. Everything happened quite by surprise. Nearly a year ago we were shopping our neighbors' store and C said by the off chance you ever decide to leave think about moving into Nest. Low and behold, they called the first week in September and wanted to scale back their retail operation and focus more on producing quilts (which are amazing, by the way). I've been itching to really get into fabric and it's made for a unique opportunity for me to apprentice, in a way and also to help keep and build their clientele. 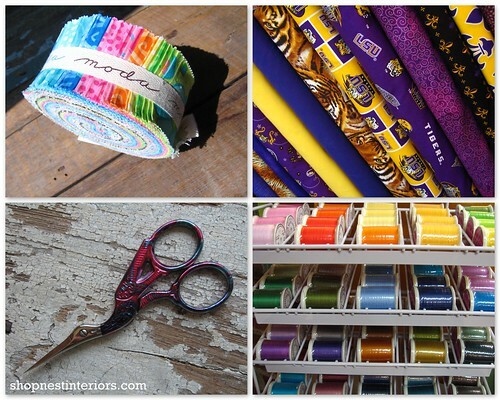 Also, they never ventured into online sales and I've agreed to assist with that...throughout October I will be building the inventory on my site; so check often as I list about 5 to 6 new fabrics a day. Oh, and an early observation about "sewing people" - they seem to be quite the introverts. Sweet as can be, they each walk in shyly clutching a partially made project...I almost have to coax out what they need. On the other hand the yarnies that knit and hook are all extroverts.